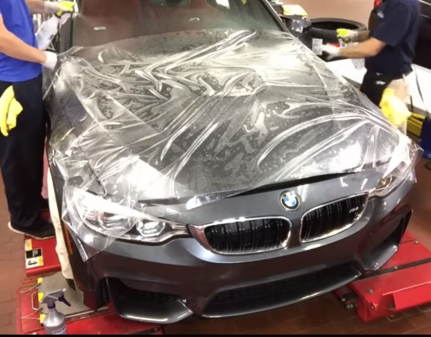 Clear Bra Paint Protection Film (PPF) is a protective film applied on a car or truck to protect the painted surfaces from chips, abrasions, and bug splatters from day to day driving. You can protect any vehicle with PPF. This film is also used on cars, trucks, RVs, motorcycles, boats, and many other vehicles. Paint Protection Film is approved by all car manufacturers. Our paint protection films are installed by our experienced manufacturer trained technicians that specialized in this field. The common parts to protect on your cars are the front bumper, hood, side mirror, rocker panel, rear fender, and rear bumper trunk edge. Modern PPF are made up of thermoplastic urethane and are easily shaped to a vehicles surface. They are crystal clear and are available in a variety of colors. We offer pre-cut and vehicle specific paint protection kits, as well as individually hand cut the film for a custom fit. You can call or stop on by to set up an appointment to get it done.